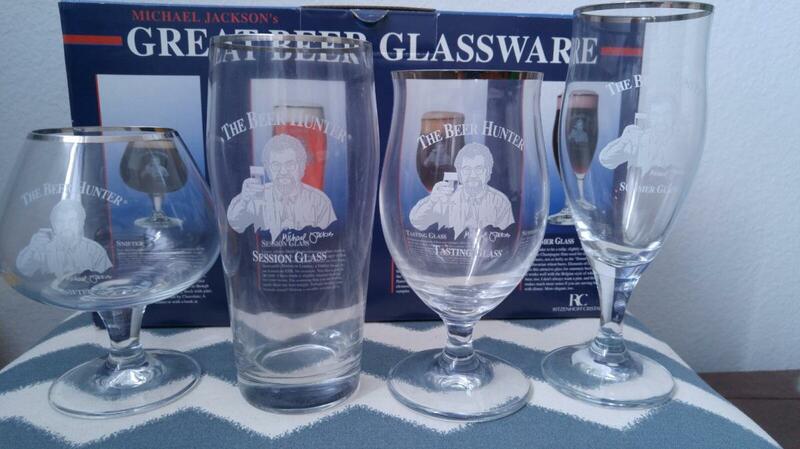 Rare and sought after glass set: MICHAEL JACKSON's Great Beer Glassware full set, including the original box. Enjoy brews just like the Beer Hunter himself did with these brand new, never used crystal glasses. The set includes: 1 x Beer Hunter snifter 1 x Beer Hunter session glass 1 x Beer Hunter tasting glass 1 x Beer Hunter summer glass THE RIGHT GLASS AT THE RIGHT MOMENT! Each Glass is Silver Rimmed. Ritzenhoff Crystal glassware made in Germany. Open to continental 48 States (USA Only) Glassware will be shipped after payment is received/verified.